Remember those days when China grumbled constantly about biased Western media and how they never let up in their criticism? Well, this week we have a markedly different voice quite close to the center of power — a publication of the Central Party school that rounds up praise from the West to show how Xi Jinping is respected around the world for his “superstrong leadership,” or chaoqiang lingdao (超强领导). A consummate piece of official flattery, the article glorifies in the “chaos of the West,” to which it says Xi Jinping offers a “clear alternative.” Also this week — speaking of strongmen — we had an exclusive interview with Russian President Vladimir Putin ahead of the Shanghai Cooperation Organization (SCO) Summit in Qingdao. The interview was conducted by Shen Haixiong (慎海雄), the official who heads up the recently consolidated China Media Group (“Voice of China”), making him, you could say, one of China’s top-ranking journalists. 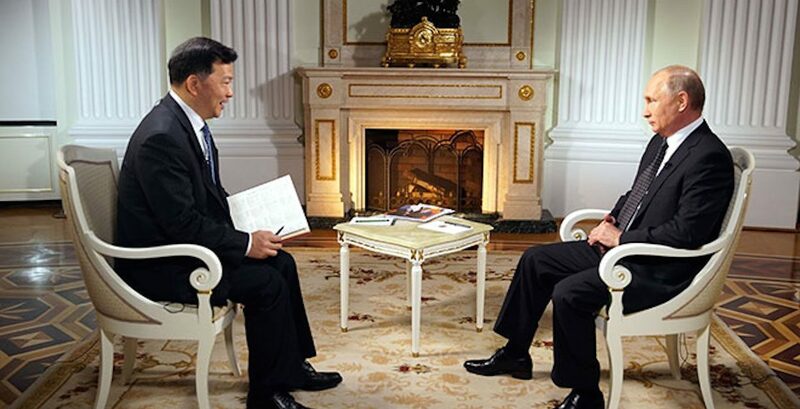 ➢ Ministerial level journalist Shen Haixiong (慎海雄) interviews Putin, heating up official coverage of the Shanghai Cooperation Organization Summit. ➢ The 2017 Annual Media Responsibility Report is released, indicators including “correct channeling” (正确引导) and “secure publishing and broadcasting” (安全刊播). ➢ Guangdong’s Cyberspace Office links up with other administrative departments to carry out a purge of so-called “online fake news” (网上假新闻) and “news extortion” (新闻敲诈). On the eve of the summit of the Shanghai Cooperation Organization (SCO), held in the city of Qingdao, Shen Haixiong, the head of the China Media Group (中国中央广播电视总台), the newly consolidated state-run broadcast network to be known outside the country as”Voice of China,” did an exclusive interview with Russian President Vladimir Putin. In the interview, which ran 40 minutes long, Putin answered questions about his impression of Xi Jinping and the prospects for the Sino-Russian relationship and the SCO. He also remarked on the Belt and Road Initiative, the North Korean nuclear crisis and other international issues. The Shen Haixiong interview with Putin comes just two months after Shen took over as head of the newly restructured China Media Group. On March 21, China National Radio, China Central Television and China Radio International held a high-level leaders meeting at which it the formation of the consolidated China Media Group was announced, and that Shen Haixiong would serve as director and Party secretary of the group. On May 31, the 2017 Annual Report on Media Social Responsibility was released. The report is the fifth to be released since a pilot report was first issued in 2014. The report measures media organization performance over the past year along 8 key indicators, including “correct channeling” (正确引导), a reference to the official demand that media work to shape public opinion to suit the political demands of the Party and government leadership, “legal operation” (合法经营), “service provision” (提供服务), “cultural development” (繁荣发展文化), “secure publication and broadcasting” (安全刊播), “attentiveness of human affairs” (人文关怀), “respect for professional rules” (遵守职业规范) and “protection of news employee rights” (保障新闻从业人员权益). According to a number of media-related WeChat public accounts that unpacked the most recent report, media organizations generally achieved the objective of “secure publishing and broadcasting” by exercising stronger controls over the social media accounts of the organization and its employees, by strengthening systems and mechanisms for “audit and review” (审读审核) of content, by applying a uniform content standard to both newspapers and social media (ensuring the latter do not report more freely), and by promoting the building of systems to gauge public opinion (舆情系统建设). The 2017 Annual Report on Media Social Responsibility was expanded to include 40 media organizations, including 6 central-level organizations, 1 industry-specific media with national reach, and 33 regional media organizations from 29 provinces and cities. The Guangdong office of the Cyberspace Administration of China (CAC) announced a coordinated effort with the public security department and other government agencies to purge so-called “online fake news” (网上假新闻) and “news extortion” (新闻敲诈) between now and the end of June 2018. The campaign will focus on rooting out unofficial and unauthorized news stories on major policies (重大政策), important events (重要活动), hot-button social issues (社会热点) and sensitive issues (敏感问题) — meaning in particular those stories posted without official approval for online news services (互联网新闻信息服务许可). On May 24, Chen Yixin (陈一新), director of the Central Political and Legal Affairs Commission, led an official discussion on “strengthening propaganda and public opinion work in political and legal affairs in the New Era.” Chen said that new media (新媒体) were rapidly becoming the principal channels and platforms for information dissemination, and there was a need to develop what he called “five capacities” (五个能力) in work on political and legal affairs: 1) the capacity for “online struggle” (网上斗争能力), “resolutely safeguarding online ideological security” (网络意识形态安全); 2) the capacity for the “integrated development” (融合发展能力) between traditional and new media, pushing determinedly ahead in transitioning the focus to social media; 3) the capacity for “brand innovation” in the political and legal affairs arena, strengthening new media brands in politics and law, “so that tens of millions of online users and hear the voice of the Party in the midst of the cacophony (让亿万网民在众声喧哗中听到党的声音); 4) the capacity for agenda-setting by new media on political and legal affairs, fully utilizing the “discourse resources of politics and legal affairs” (政法话语资源) to create unique hot topics that allow “firm grasp of the initiative and discourse power by new media in the public opinion arena”; 5) the capacity for new media on political and legal affairs to “attract fans” (引关圈粉), becoming media than online users turn to.